Risk it all in live casino action in Vegas Stakes! Check into your favorite hotel, meet up with friends in the lobby, and you're ready to go! Place your bets! 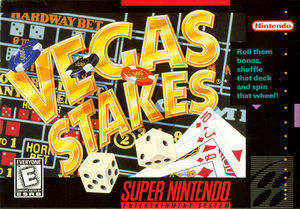 Blackjack, Slots, Roulette, Craps and Seven Card Stud poker promise fame and fortune. Parlay your stakes into a serious bankroll and shoot for the $10 million goal! Your companion will give you odds, advice and rules. Even beginners can master these realistic casino games. Put your money on the line and trust Lady Luck. It's an all-or-nothing ride to Vegas! The graph below charts the compatibility with Vegas Stakes since Dolphin's 2.0 release, listing revisions only where a compatibility change occurred. This page was last edited on 21 February 2018, at 03:28.